Steve Gibson during his first spell with Whitley Bay. 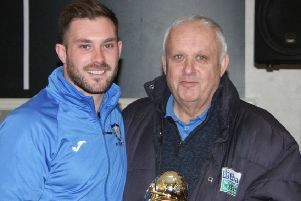 Whitley Bay Football Club are looking back as they build a team for the future ahead of next season. Two of the four new signings already made by manager HIllheads Paddy Atkinson and his assistant Paul Johnson are former Seahorses returning to the Northern League division one side. Former Bay favourite Steve Gibson, a member of the team that won the FA Vase in 2011, the last of the record-breaking four times they won the trophy, is back. The defender, formerly captain of Chertsey Town, is being joined by winger Kris Hughes. Hughes was also at Hillheads Park in 2011, as a youngster. He returns after spells at Jarrow Roofing, Consett and Billingham Synthonia. Bay’s other two signings are both from Team Northumbria, goalkeeper Andy Jennison and central midfielder Mark Bertram. Bertram captained the Newcastle-based side last season as they narrowly missed out on promotion back to the first division. A member of last season’s squad, midfielder Alex Kempster, has also signed up for the forthcoming campaign, and more players are expected to put pen to paper prior to Whitley Bay’s next game, a friendly against Dalbeattie Star, on Saturday, July 4.